Getting families talking—and talking about what really matters. That is what Table Talk does. al diet by adding meaningful discussions to the menu. Table Talk includes hundreds of fun, thought-provoking questions and quotes that facilitate conversations about life’s most important issues. expectations about patriotism, morality, fun, and faith. A perfect gift for young and teen families. www.tabletalkbook.comand learn more, peek into the book, see a neat video about it, and more. -Take a Look! Get Hooked in the First pages of the book. -Ordering: Currently $11.89 on Amazon and $5.99 on Kindle. "Grace is being good to a person, loving a person," Bishop North clarified, "not because that's what they deserve, or earned with you, but because you love them and you want what's best for them. That is the love and grace that God has shown us -impractical grace." A marriage in ashes, a heartbreaking accident, and an excruciating childhood - is there any limit to God's power to heal, strengthen, and transform? Bishop North helps the members of his ward as they try to overcome life's challenges. Take part in these doctrinal insights to the Savior's grace and love in this compelling novel full of true to-life stories of hardship and hope. "Blown away. Impractical Grace is an important book for our generation. I am going to go buy several copies and start giving them to people that I love (my sisters, my bishop, a couple of nieces and nephews that are about to leave on missions, etc., etc.). I marked the book up with stars and underlines and light bulb sketches and comments like "big", "wow", "never thought of this before" (p. 116), "major", "direct answer to prayer" (p. 160). The book shows that we can overcome difficult challenges in this life (abuse, difficult marriages, personal tragedies) through the atonement of Christ. I loved it." "I LOVE YOUR BOOK! The way it teaches about our Savior's love is really wonderful. You have done an excellent job in creating something special. I like how it's a novel that teaches along the way. (kind of like a parable) It's nice to read and ponder about what I am re-learning." "What a wonderful way to explain how the principle of grace can and should work in our lives! I really enjoyed reading this book! I do hope to be able to use the suggestions in my life to better relationships with others, especially those who may be difficult, for various reasons to forgive. I believe everyone can recognize a little of themselves in the characters, because we all live imperfect lives. Letting ourselves feel God's grace and love really is the only way to have his light in us, so we may pass that light and grace on to those around us." 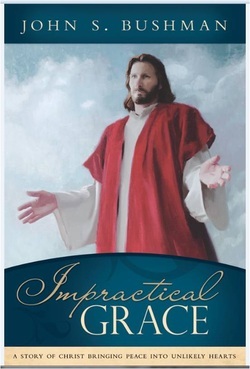 "Impractical Grace is one of those must-read books that leaves you better than you were before reading it. It's full of thought-provoking doctrine, as well as a driving plot. I learned so much as I read this book!"